What are preeclampsia and eclampsia? Who is at risk for preeclampsia and eclampsia? What are the symptoms of preeclampsia and eclampsia? How are preeclampsia and eclampsia diagnosed? What is the treatment for preeclampsia and eclampsia? What are complications of preeclampsia and eclampsia? Can preeclampsia and eclampsia be prevented? What is the outlook (prognosis) for preeclampsia and eclampsia? Preeclampsia is a condition of pregnancy characterized by high blood pressure (hypertension) and protein in the urine (proteinuria). Preeclampsia usually occurs after the 34th week of gestation, but it can develop after the infant is delivered. Preeclampsia and eclampsia develop most commonly during the first pregnancy. Pregnant teens and women over 40 are at increased risk. Eclampsia is the development of seizures in a woman with severe preeclampsia. It has a 2% mortality (death) rate. There is no cure for preeclampsia except for delivery of the baby. Women with mild preeclampsia may be treated conservatively to allow the baby to mature, as long as they are closely monitored. They may be given corticosteroids to help the baby's lungs mature and magnesium sulfate to prevent seizures. Sometimes, medications to lower blood pressure are needed. Fetal complications of preeclampsia include the risk of preterm delivery, oligohydramnios (low fluid volume within the uterus), and sub-optimal fetal growth. Maternal complications of preeclampsia and eclampsia include liver and kidney failure, bleeding and clotting disorders, and HELLP syndrome. There is no known way to prevent preeclampsia. The exact cause of preeclampsia is not known, although both genetic (inherited) and environmental factors are likely to be involved. Preeclampsia is a condition that can develop during pregnancy characterized by high blood pressure (hypertension) and protein in the urine (proteinuria). If not properly recognized and managed, preeclampsia can progress to eclampsia, which is defined as the development of seizures in a woman with preeclampsia. Eclampsia is serious for both mother and baby and can even be fatal. Preeclampsia was formerly known as toxemia of pregnancy. Without treatment, it has been estimated that 1 out of 200 cases of preeclampsia will progress to seizures (eclampsia). Estimates of the incidence of preeclampsia range from 2% to 7% in healthy women who have never before given birth. Preeclampsia occurs after the 20th week of pregnancy and can occur during the days following birth. Some reports describe preeclampsia as occurring up to 4 to 6 weeks after birth, although most cases of postpartum preeclampsia occur within 48 hours of delivery. 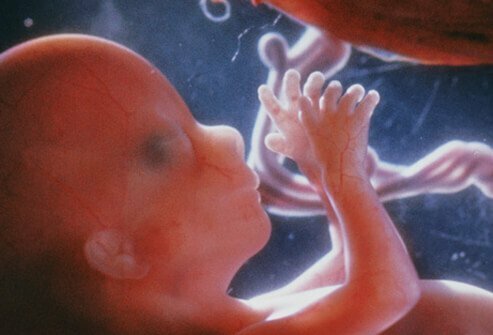 A mahority of cases occur after the 34th week of gestation, and 6% occur after birth. Preeclampsia and eclampsia are most common in first-time pregnancies. Pregnant teens and women over 40 are also at increased risk. The concept of blood pressure is sometimes difficult to understand because it is usually described with numbers. However, adequate pressure within arteries is important to allow blood to be pumped throughout the body to deliver oxygen and other nutrients to areas of the body. This allows for normal metabolism and organ function. The blood pressure recording, measures pressures within the arteries at two different times. The first reading, the systolic pressure, measures the pressure when the heart is pumping blood to the body through the arteries. The second reading, the diastolic pressure, measures the pressure within the arteries when the heart is receiving blood returning from the body. There needs to be an underlying pressure within arterial blood vessels regardless of whether the heart is pumping or not. This intrinsic pressure is maintained by smooth muscle cells that surround all artery walls, great and small, and in effect squeeze and support the walls. Without this wall support, arteries would collapse in diastole (between each heart beat). Blood pressure measurement is listed with two numbers with normal being less than 120/80, with 120 being the systolic blood pressure when the heart is pushing blood through the arterial system; and 80 being the diastolic blood pressure when the arteries are at rest and the heart is refilling. The exact cause of preeclampsia and eclampsia is not fully understood, but it is believed to be a disorder of the lining of blood vessels. Abnormalities of the placenta have also been described. It likely arises due to a combination of factors, including both genetic and environmental influences. A number of genes have been studied as being potentially involved in preeclampsia, and there is an increased risk for women with affected family members. Nutritional factors, obesity, and the immune system may also play a role in its development although this is not yet fully understood. Some studies of the immune response in preeclampsia have shown problems in the way certain cells of the immune system interact with each other to regulate the immune response. Most women with mild preeclampsia do not have any symptoms. The hallmark signs, as mentioned previously, are the presence of protein in the urine and elevated blood pressure. Swelling of the feet, legs, and hands is also common, but this can occur in normal pregnancy and is not necessarily related to preeclampsia. Women with preeclampsia may experience sudden weight gain over 1 to 2 days. Other symptoms and signs that can occur with severe preeclampsia include dizziness, headaches, nausea, vomiting, abdominal pain, vision changes, changes in reflexes, altered mental state, fluid in the lungs (pulmonary edema), and a decrease in urine output. Symptoms of eclampsia include those of preeclampsia along with the development of seizures. When seizures occur, they are most often preceded by neurological symptoms like headache and vision disturbances. Women with severe preeclampsia may have a reduced platelet count (below 100,000). Signs and symptoms of preeclampsia go away within 1 to 6 weeks after delivery of the baby. Preeclampsia may be diagnosed at a regular pregnancy health screening. Protein in the urine is diagnosed by a urinalysis, and blood pressure measurements taken in the clinic may show elevated values. Blood pressure in preeclampsia is usually over 140/90. Blood tests, such as blood cell counts and tests for blood clotting ability, can also be done. Recent research has shown that Congo red (CR) spotting tests may be better indicators of preeclampsia than standard urine dipstick tests for proteinuria. The test is based on the fact that the urine and placentas of women with preeclampsia contain abnormally folded proteins that bind to the Congo red stain. Since preeclampsia may be asymptomatic (produce no symptoms), it is important for pregnant women to have routine health checkups. Tests to monitor the health of mother and baby will also be ordered. There are no predictive tests to show whether or not a woman will develop preeclampsia. There is no cure for preeclampsia and eclampsia other than delivery of the baby. The decision about whether to induce labor or perform a Cesarean section depends upon the severity of the condition, as well as the gestational age and health of the fetus. Women with mild preeclampsia are often induced at 37 weeks' gestation. Prior to this time, they can be managed at home or in the hospital with close monitoring. During this time steroid drugs may be given to promote maturation of the baby's lungs. Women with mild preeclampsia prior to 37 weeks' gestation are often placed on bed rest with frequent medical monitoring. In severe preeclampsia, delivery (induction of labor or Cesarean delivery [C-section]) is usually considered after 34 weeks of gestation. The risks to the mother and baby from the disease must be balanced against the risk of prematurity in each case. Intravenous magnesium sulfate can be given to women with severe preeclampsia to prevent seizures. This medication is safe for the baby. Oral supplements containing magnesium are not effective in preventing seizures and are not recommended. Medications such as hydralazine to lower blood pressure may also be given. Eclampsia is a medical emergency. It is treated with medications to control seizures and maintain a stable blood pressure with the goal of minimizing complications for both mother and baby. Magnesium sulfate is used as a first-line treatment when eclamptic seizures do occur. If the seizures are not controlled by magnesium sulfate, other medications such as lorazepam (Ativan) and phenytoin (Dilantin, Dilantin-125) can be administered. Preeclampsia reduces the amount of blood flow to the placenta and the fetus. Therefore, the baby may have delayed growth and low birth weight. Preterm delivery is also more common. Oligohydramnios, a decrease in the volume of amniotic fluid, is a frequent accompaniment of preeclampsia. Preeclampsia increases the risk of placental abruption, or separation of the placenta from the wall of the uterus. When this is severe, life-threatening bleeding and fetal death can occur. Severe preeclampsia can affect liver and kidney function. HELLP syndrome, hemolysis (destruction of red blood cells), elevated liver enzymes, and low platelets, is a rare complication of preeclampsia. Symptoms include headache, nausea, vomiting, and right upper quadrant abdominal pain. In some cases, HELLP syndrome develops before the typical signs of preeclampsia are apparent. Other uncommon complications of preeclampsia and eclampsia include decreased blood flow to the brain, resulting in a stroke. There is no way known to prevent preeclampsia and eclampsia. However, the outcome can be improved with prompt recognition and management, so it is important for pregnant women to have routine health screenings. Most women with mild preeclampsia have good pregnancy outcomes. Eclampsia is a serious condition with about a 2% mortality (death) rate. The recurrence risk for preeclampsia varies according to the onset and severity of the condition. Women with severe preeclampsia who had an onset of the condition early in pregnancy have the highest recurrence risk. Studies show recurrence rates of 25% to 65% for this population. Only 5% to 7% of women with mild preeclampsia will have preeclampsia in a subsequent pregnancy. Women with preeclampsia may be at increased risk for cardiovascular disease later in life. This risk is greatest in women with early onset of severe preeclampsia. Research is ongoing to further clarify this potential risk. What are early pregnancy symptoms? In some women, symptoms range from a missed period to feeling lightheaded. Others may experience typical "morning sickness" and food cravings. Could you be pregnant? Take the quiz!